December 1944 and the Reich is steadily crumbling. In the skies over Germany the raids by Allied heavy bombers continue unabated, but even as the Germans retreat, the intensity of the fight never diminishes. 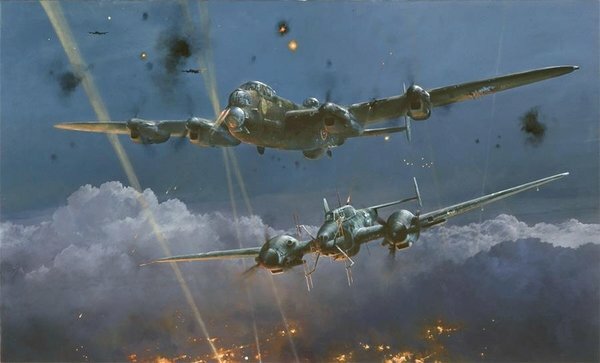 Lancaster Under Attack - one of Robert Taylor’s most famous and collectible paintings - depicts a scene typical of the perils endured by the bomber crews. An RAF Lancaster of 626 Sqn takes evasive action as a Luftwaffe Bf110 night-fighter makes a potentially deadly pass beneath the bomber, during a raid over Osterfeld in the heart of Germany. Although long sold out and now highly collectible as a signed limited edition print, we are delighted to announce that this epic release is now available as a Giclée Studio Proof on canvas.